This month we are hopping with a "Love" theme. What wasn't to love about Novembers OnStage Live experience. I could honestly do a WHOLE scrapbook or two with all of the pictures I have. This was one of the best experiences of my Stampin' Up! life. 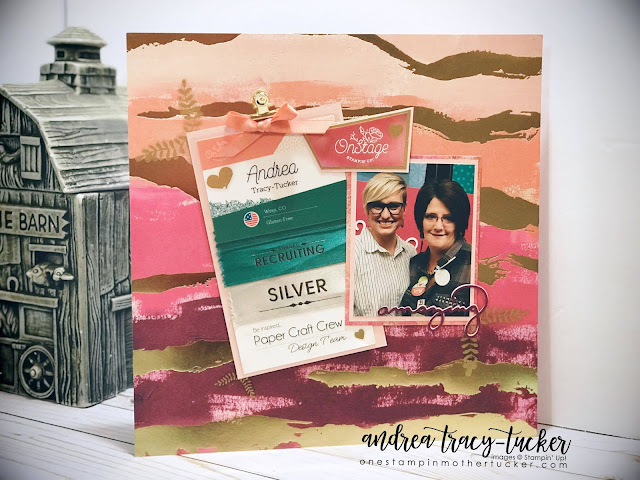 It was definitely kicked up a notch when I had the fortunate opportunity to meet the CEO of Stampin' Up! Sara Douglass. The funny thing about my page below, recently Sara was live on Facebook making the CUTEST cupcake box. She used this very piece of DSP. I gasped and responded to her with "I can't cut the piece of paper". Sara quick replied "Andrea! You have to cut the paper!!!". Guess what?! I didn't cut the paper, and chose it to showcase some OnStage memories! I can't lie! This was a rather easy page to whip up! It helps when Jenny Hall and I were video chatting because scrapbooking still gives me some anxiety. Especially when I have procrastinated!!! The Painted with Love DSP and coordinating stickers were perfect for this project. I matted my ribbons and name tag on Powder Pink card stock and added a nice Calypso Coral bow from the SAB ribbon pack. The Gold Library clip was a nice touch. I had a photo of the main stage back drop that I cut a matte of Gold Foil and Powder Pink to match the angles. The photo of Sara and I was taken right outside the Main Stage, yes I was emotional! It was an AMAZING experience and I will treasure it for years to come with this amazing page. I cut the amazing from the Celebrate You thinlits. I cut it out of Melon Mambo, Powder Pink and Rich Razzleberry. Because this moment was just that! I can not wait for you to see what Tanya has in store for you! It is sure to be amazing! You can get to her by clicking the next button below or there is a full list of hoppers at the bottom you can also click through that way as well! Love the layout, Andrea. Especially, how you incorparated your ribbons. I need to do something like that. Thanks for the inspiration. Absolutely gorgeous! This page deserves a frame and to be hung up in your craft room. I remember this day! You and the page look fabulous. I really like the layout and agree with Jenny, frame it! How could you not!? I mean this was when my Kardashian like booty photo was taken! LOVE this page! I agree with Jenny - it needs to be framed and hung! A great memory from a fun Stampin' Up! event! Totally AWESOME page! I love how it turned out especially using your ribbons. Now I know what I'm going to do with my ribbons! Wow... beautiful page and LOVE the picture! That DSP is so gorgeous... definitely frame-worthy!